You can buy your tickets here (brunch tickets include full F&B and an open house beverages bar from 2pm to 5pm, while VIP tickets mean full F&B and an open house beverages bar from 2pm to 11.30pm). (See the timings of who is playing when – including the amazing local acts that will be hitting the stage – here). British electronica legends Tom Rowlands and Ed Simons – aka The Chemical Brothers – are no strangers to the UAE. They headlined one of the F1 after-race concerts in Abu Dhabi back in 2016, and now they return to the Emirates for What’s On’s Party In The Park. The Chemicals are one of the biggest names in dance music – and they come with quite a pedigree. First off, there’s the eight studio albums, starting with 1995’s seminal Exit Planet Dust and ending with 2015’s Born In The Echoes. Then there are the awards. They’ve won four Grammys and have been nominated for another seven. But that’s just the tip of the iceberg – they’ve also won a Brit award, plus several MTV gongs. The music world also has quite an appreciation of the duo, and their list of collaborations is even more impressive than their trophy haul. Over the years they’ve worked with Britpop legends Bernard Sumner (New Order), Noel Gallagher (Oasis), Richard Ashcroft (The Verve singer who performed at Party In The Park back in 2014), plus Michel Gondry, the French director who won an Oscar for his movie Eternal Sunshine Of The Spotless Mind. So what can you expect from Tom and Ed when they come to Dubai? The duo will be performing a DJ set, meaning you’ll get to explore all the music that has influenced their careers. So get ready for a few Chemicals hits, and a whole lot more. Don’t forget, they’re onstage after Liam Gallagher, so get ready to party into the early hours. The Chemicals’ hit Setting Sun features Noel Gallagher on vocals, but originally, his brother, Party In The Park headliner Liam, was meant to sing the song. Search for Comin’ On Strong on YouTube to hear the demo version. It was one of the standout musical moments of this summer. One Love Manchester, the concert put together by Ariana Grande in the wake of the terrorist attack at her Manchester gig, announced a last-minute surprise guest. A man in trademark cagoule and sharp haircut strode on stage, pointed at the stunned crowd, and bellowed “Manchester vibes in the area.” Launching into Rock ’n’ Roll Star, Liam Gallagher, former frontman of Oasis and newly revitalised by his forthcoming solo album, was very much back. Gallagher proceeded to actually sing the next five minutes of brash, bellicose guitar rock rather than snarl it – a refreshing state of affairs given, in latter years, it had felt like this abrasive, insouciant and often indifferent 44-year-old had become something of a caricature of himself. The new song he played next – Wall Of Glass – wasn’t a terrible, try-hard echo of John Lennon but an effective blues-rock anthem complete with gospel backing. Which has, for most of his adult life, been living the rock ’n’ roll dream. In the early 1990s the limit of an indie band’s ambition was to bag a Top 20 single. Gallagher promised that Oasis would be “as big as The Beatles, if not bigger”. It helped that he had an older brother, Noel, writing a slew of brilliant songs – although as time passed, money and lifestyle corrupted the spontaneous creativity that saw 40 million people take Definitely Maybe and (What’s The Story) Morning Glory? to their hearts. And as the records became less successful, the stormy relationship between Liam and Noel reached breaking point. Of course, Liam’s attitude to sibling rivalry was never particularly positive. He has always been of the view that “everyone knows that if you’ve got a brother, you’re going to fight”. Noel, meanwhile, suggested that Liam’s constant intimidation had made being in a band with him “intolerable”. It’s not difficult to imagine Liam rubbing people up the wrong way – even after Oasis had split, the constant (and admittedly slightly amusing) Twitter baiting of his brother – “To all you NG fanboys I can and will sing any song he wrote bigger better than him even if I was kicked in the b****x by a wood pigeon” – garnered him more column inches than his first band, Beady Eye. But it does now feel like new Liam Gallagher music might finally take centre stage. Perhaps that’s because Liam has been working with hit producers and songwriters such as Greg Kurstin (Adele, Lily Allen) and Tom Odell for new album As You Were. “I’ll play him [Odell] a tune very badly and he’ll go, ‘Yeah, I get where you’re coming from’ and get the acoustics down and away we go,” he told The Guardian. Any accusations that such working arrangements might be inauthentic are given short shrift. Liam has always been a singer rather than songwriter – probably wisely in the case of Little James: his attempt to write a song for Oasis (and his young stepson) has some of the worst lyrics in pop music history. Still, if anyone doubts Liam Gallagher’s magnetic pull – or the timeless, anthemic and influential quality of the songs he sings – then it’s worth rewatching Coldplay’s Chris Martin as he plays Live Forever alongside Liam at the One Love Manchester concert. Martin is singing along as a fan, unable to keep a smile off his face – it’s as if he’s won a competition and can’t quite believe he is there, performing one of Oasis’ very best anthems, with the best frontman of his generation. All this after Liam had been, well, typically Liam about Coldplay in the past, likening Martin to a geography teacher and a character in children’s TV show The Tweenies. And perhaps that new, happy-go-lucky Liam (he’s in a more stable relationship these days, too) means that he’s not afraid to recognise that the early years of Oasis will always contain his best work. What he misses about Oasis is “singing them songs”. So it has felt right for him to play D’You Know What I Mean, Rockin’ Chair, Slide Away, Be Here Now, Rock ’n’ Roll Star and Morning Glory this summer, and give them everything he’s got. A perfect headliner, then, for Party In the Park in Dubai. Not so much an aspiration as a statement of fact, Liam completely owns the opening song on Oasis’ debut album from its very first soaring line. Liam’s solo gigs this year have exploded into life with Rock ’n’ Roll Star – as they should. Proving that Liam wasn’t all snarl, Live Forever is effectively a ballad. It’s not exactly the stuff of rock ’n’ roll, but he imbues Noel’s classic anthem with equal parts heart, soul and – crucially – cool. Liam only sings the verse on this brilliant b-side, but it’s the contrast between his impassioned vocal and his brother’s slightly weedy chorus that proves that Oasis would have been a very different, less interesting proposition without the younger brother. They have a celebrity fan base led by Noel Gallagher and Johnny Marr. They perform to sellout gigs in the UK. NME champions them, and now British neo-psychedelic pop rock band Temples will fly over for Party In The Park (thanks to the lovely folk at Fred Perry, who are bringing the band over here for our listening pleasure). Formed in 2012, the four-piece from Northamptonshire has seen their popularity soar over the past five years. Their second single, Colours to Life, has been viewed more than 2.4 million times on YouTube, while their latest album Volcano was rated 4 out of 5 by NME, who described the lads as “supremely gifted melodists and assiduous students of the past”. Expect spoonfuls of retro psychedelic sugar when the lads hit the stage on November 10. If you like the sound of a British summer day out with deckchairs, picnic tables and food trucks, you’ll want to position yourself at the Good Garden. Powered by the lovely folk at Good magazine, it’s a place to chill among the festival madness. The area will be surrounded by pop-up stalls from local vendors selling art and crafts, fashion, accessories and more. You can bet your bottom dirham that this area will be filled with local artisans and gourmet goods. If you can think of a better way to spend an afternoon than tucking into an alfresco brunch in the centre of all the action, with a perfect view of the What’s On Main Stage, then we’d like to know about it. You can get an unlimited barbecue brunch (including BBQ meats, pub grub, salads and sides) courtesy of the team from McGettigans from 2pm to 5pm, plus entry to the festival for just Dhs650. If festivals are about food rather than flower crowns for you, we’ve got you covered. Get ready for burgers courtesy of Shake Shack and Famous Dave’s, finger-licking food from Bazxar crew, and delicious pie slices from Freedom Pizza and 800 degrees. Get your grub on. 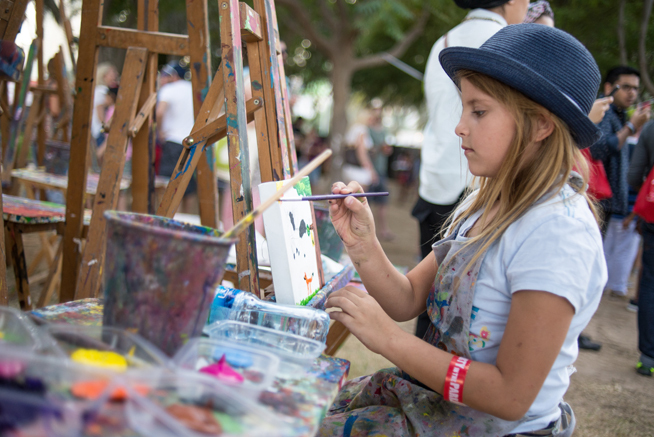 Regular tickets to the festival are available via Platinumlist.net and cost Dhs350. Children and more than welcome at Party In The Park. The park opens at 2pm so come down early, bring a blanket and enjoy the day! Brunch tickets are available via Platinumlist.net and cost Dhs650. This includes entry to the festival and the elevated brunch deck. Over 21s only. VIP tickets are available via Platinumlist.net and cost Dhs995. This includes access to the VIP deck with unlimited food and drink plus entry to the festival. Over 21s only. 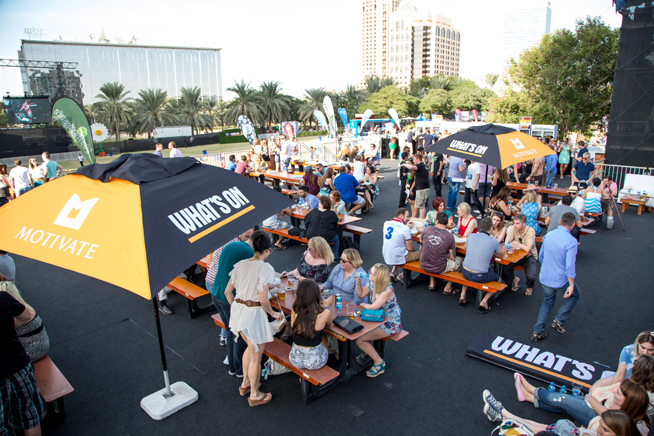 Dubai Media City Amphitheatre, Dubai Media City, Dubai, Dh350, Dhs650 for brunch, Dhs995 for VIP. Tel: (04) 2743555. Metro: Nakheel. Buy your tickets here.